Red knit caps on our heads, mist hugging the mountains, and a road leading straight into them. Follow us along for this first of Red Hat Factory’s Adventure Stories. 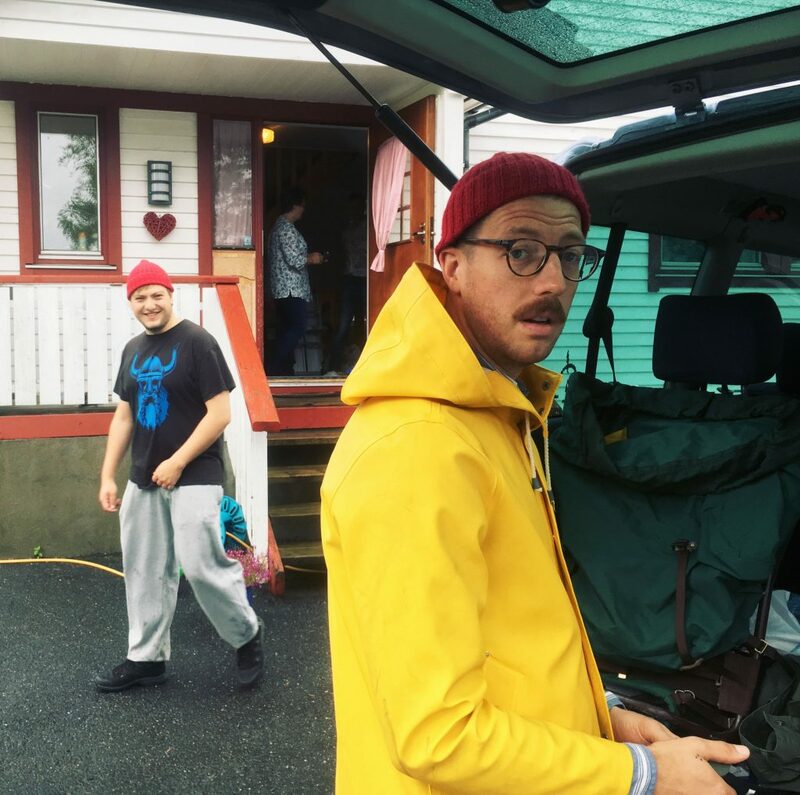 Asbjørn & Ben is the traveling crew that will make this journey one of epic proportions. 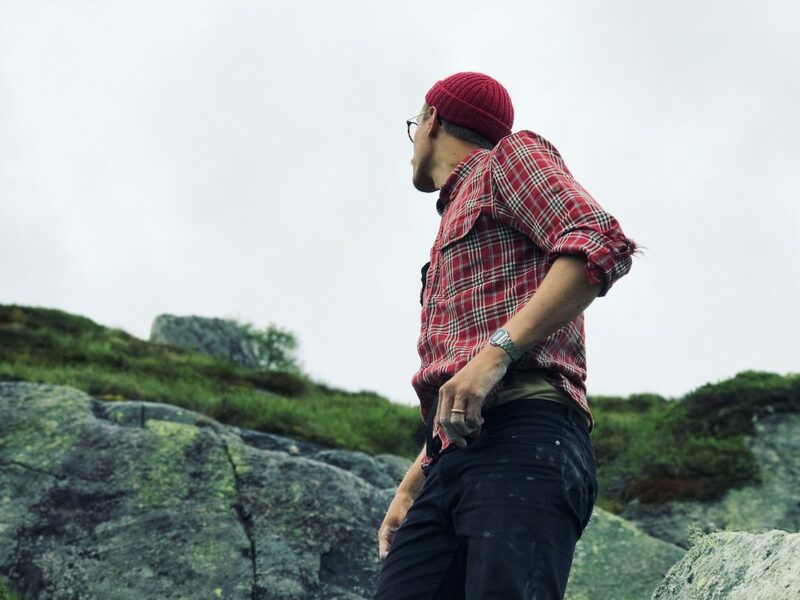 The Norwegian attitude that there is no bad weather, only bad clothes is deeply ingrained in us all (even the American Ben, after him getting married to a Norwegian), and we are determined to defy the weather hunting that freedom nature has to offer. The mists lay low around the mountain tops at the place we are aiming for, and the roads are ripe for driving. Miles of asphalt will be covered, and traces of our rubbery wheels be spread from the Southern Coast of Norway, far into the misty mountains. Ben and Asbjørn don’t know much. Only that adventurers should wear red hats. Mist lay like a ribbon. The further we get into the valley, the higher the mountainsides grow, and the steeper they push upward. The mist lays like a ribbon across the mountains at a certain height. First time we take a break from the roads is to watch a large waterfall, and after exploring that area for a while, we continue towards the beginning of the winding mountain road. Asbjørn has gotten his red hat, and that makes all three of us red hatters on this particular trip. 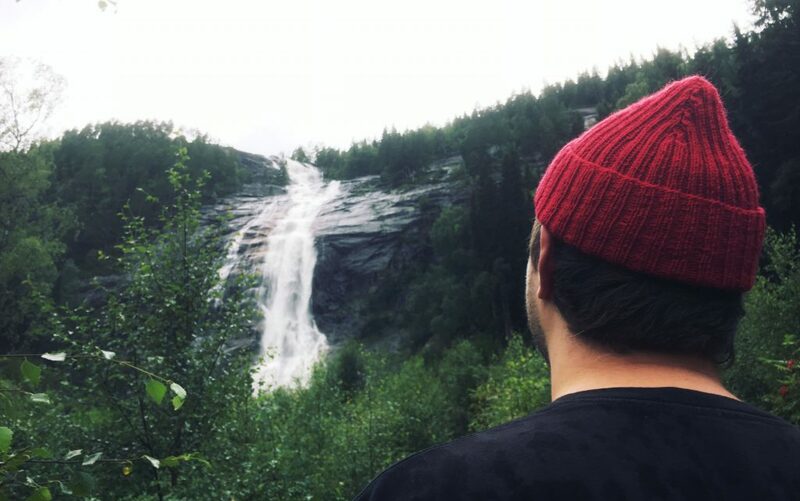 Asbjørns watches the falling water, red hat shining like a beacon up top. Soon we begin the ascension, and go from about 200m at the bottom of the Setesdal valley to about a kilometer above sea level, we make our first stop and go climbing towards the top of a rock, hidden in the mist. 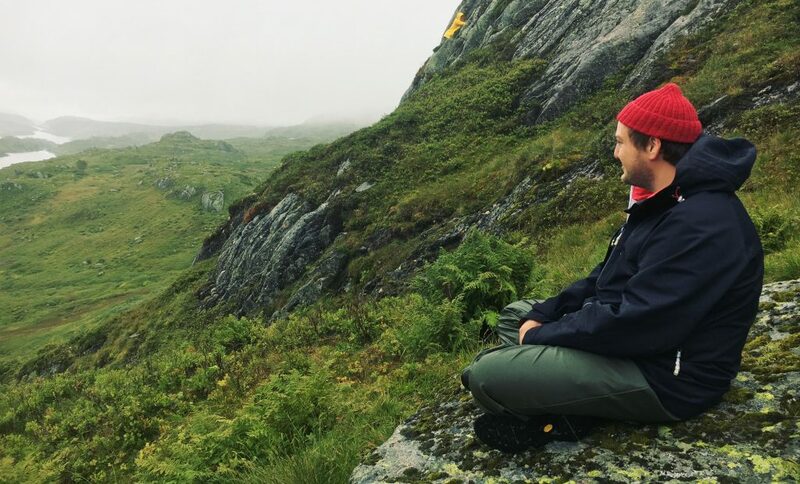 On our way up, Asbjørns stops to enjoy the view. When you sit down, the only thing you hear is the creeks splashing their way down towards a lake, and the bells from the sheep in the distance. In the background Ben is struggling up a hill, trying to conquer it while wearing large boots. ?? Some years there have been at least seven thousand sheep grazing these mountain areas, but since their areas stretch so wide, we only see small groups at once. My grandma once sat down and told me and my wife about when she was young and visited these exact mountains to watch the sheep gathering. They were laying on a rock, looking down, while two thousand sheep passed underneath them, and then the next day they got to see five thousand in one single large herd. And here they are. A few of those seven thousand. They stand in the middle of the way and block us from moving further on, and they are quite clear on who owns this area. At times we roll down the windows and scratch them on the nose. We and the sheep equally enjoy it. Good to be able to give a scratch back to the ones that bring the wool for our red headwear. ?? One of seven thousand wooly creatures. 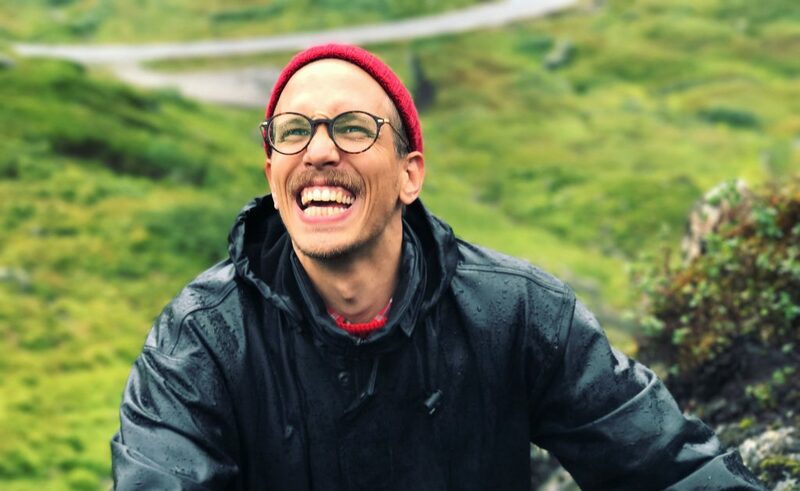 As a Norwegian currently living in Stockholm’s asphalt jungle, it is a pure joy to be able to spend a day hiking through the mountains, as you can see from the excessive amount of visible teeth. The silence. The rain in your face. The challenge of getting to the top. The smell of no smog whatsoever, and the fresh air of the mountains. When you have set yourself on a goal, keep pushing. No matter what rain falls into your eyes, or how many times your boots slip on the grassy grounds. Keep exploring. Keep on not giving up. ?? This first part of the trip, mist truly covers everything. Sometimes we are stuck in an ocean of pure grey, constantly moving around us. At other times the winds sweep across where we are and pull the mist apart so we can see glimpses of what lay in the distance. Ben is deep in in the mist, but for a moment we can see down into the valley beyond. The red hat and the yellow jacket makes him stand clearly out within the mist. Finally, after slowly progressing deeper into the mountains, we arrive at the destination I had secretly decided upon. A valley in the very heart of the mountain opens up before us, and at this point the mists have cleared out, so that we can see as far as the eye allows. Here we set up a simple camp—a tarp protecting everything from the rain, and a fire to cook over. ?? We grill some meats, some veggies, and completely destroy some potatoes in the fire. Eventually the 7000 sheep will have to come and fight over those few charred black potatoes, where they are now dumped in the grass. I am sure they will have a blast devouring them. ?? After the meat, we bring up the Norwegian delicious milk chocolate we brought, and melt it over the fire. Blueberries are dipped into it, making it a true Norwegian fondue. After the meal is consumed, the weather has cleared up significantly, and while Asbjørn has gone scouting for the highest tip of the mountain we’re on, me and Ben go slowly upwards while conquering small boulders and cliff faces on our way. Climbing shoes are on, and some boulders have dried up enough for an amazing climb. I am looking towards to top, searching for a climbable boulder. The red hat edge is doubly folded to accommodate the summer temperatures. Looking towards the top, we find that Asbjørn has gone out of sight—even further than we expected—and set our noses to find him. Still bouldering on everything we find, we finally see Asbjørn sitting on a rock on the very tip of the mountain, and the view from up there is a breathtaking one-eighty degrees panorama as far as the eye can see. The landscape stretches out as far as the eye can see in all directions and many of the most distant mountains are covered in snow. At the very top, the vast expanse of the valley is fully visible, and, adding even more paint strokes to the panorama, the sun breaks through the clouds in the distance, making the view surreal. Standing there on a boulder together with two of my best friends in life, I am reminded of an old Norwegian folk tale. In this tale, a man owns a pair of boots that takes him 70 kilometer per stride, and he jumps from mountain top to mountain top. Looking out here, I can only imagine a daddy sitting on a boulder like this one, with his children, making up this story as they look out over the mountain tops. From there the story is told and spread, until it is written down and woven into the fabric of Norwegian heritage. ??? The panoramic view is made even more breathtaking by the sun breaking free from the clouds kilometers away. The day is almost passed as darkness falls, but still we have a drive of four hours before our heads can hit the pillow. On the way home, we just have to go up and touch one of these patches of snow that stays there through the entire summer because of the high altitude. And as Asbjørn & Ben hikes a little further ahead, I climb the last rock of the day and takes in the sight of the mist-wreathed mountain pass marking our way home. Ben and Asbjørn explores the last area of the day. Red hats making sure, I know exactly where they are at all times. And here the story ends for this time. You can read the story in it’s original form at the hashtag #rhflostinthemist or keep track of all our adventure stories at #rhfadventurestories.